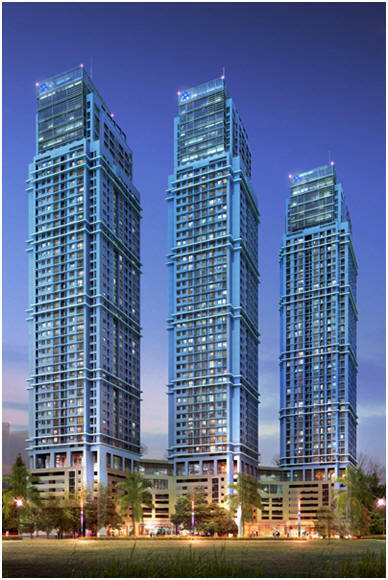 This mixed-use residential development includes three (3) residential towers with 1,000 apartment condominiums on an eight-story retail/parking base adjacent to the Bassac River and overlooking downtown and the Tonle Sap and Mekong Rivers. With the city's population projected to double within the next 10 years, the project is part of the Camko City office and residential area under development south of Phnom Penh's historic Center City. At 45-stories, the buildings are the tallest in Cambodia. Building lobbies, retail uses and building support functions are interwoven on the ground floor level of the building's base with the above-grade parking garage spanning the building's entrance drive to provide sheltered and shaded drop-offs at each building entrance. The roof deck of the garage contains an outdoor pool terrace with adjacent fitness center, locker rooms and sky lobby/entertainment areas overlooking the terrace and surrounding cityscape. Each of the apartment blocks are rotated to provide panoramic views from all of the units. The setback at the 38th floor provides private roof terraces for the penthouses contained behind the crown-like scrims on the four to six topmost floors. The project contains a total of 1,000 luxury apartment and penthouse condominium units.